his, also intelligent, sidekick Robin…err…Dr. Watson , use not only rational thought, but Kung-Fu, Ju-Jitsu, sword canes, riding crops and revolvers to save the day! Who could not love this movie? Through all the fast paced action scenes, accidental boat sinking and bare knuckle brawls; it is still Holmes and a very excellent Watson. 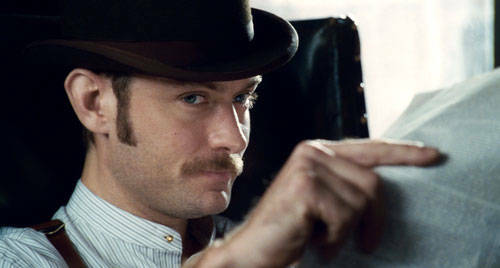 Director Guy Ritchie has made the 19th century action hero an appealing character to a 21st century movie audience. Ritchie has been able to keep the essence of the thinking man and add all the aspects that were left behind in most translations of Holmes from paper to celluloid. Besides Sherlock having to actually use the clues presented to solve the problem of the evil Lord Blackwood’s rise from the dead, Holmes must contend with an unseen force; Moriarty , of course. Many are the references to the original works and lots of dialogue is plucked from the canon. I counted 10, myself, and if I watch it again, no, when I watch it again I shouldn’t be surprised to find more. 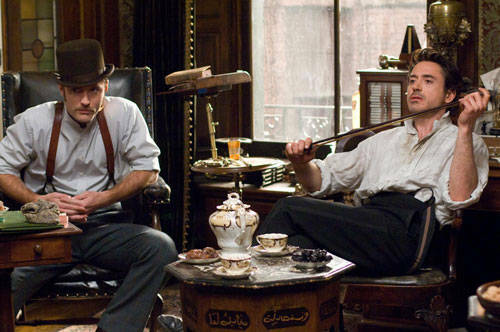 The casting is magnificent with Robert Downey, Jr. as Holmes and Jude Law as Watson. The two gentlemen click and you believe their camaraderie is real. There is the constant banter you would expect between close friends. Watson is inspiring in his devotion to Holmes, his steadfast determination, his quick wit and his fighting ability. The scenery, locations and computer generated backgrounds are astounding. Costuming alone must have cost a fortune. Okay, yes the canon has been messed with a bit; it’s 1891 but Holmes is in London and not on the great hiatus, Irene Adler doesn’t come back as a jewel robber and Mary Morstan didn’t have to be introduced to Holmes as Watson’s fiancé because he already knew her. Oh and she had no family even though in the movie she does. But it’s a small price to pay. Jude Law was born in London 29 December 1972. He was acting by the time he was 12 in the National Youth Music Theatre and when he turned 17 he quit school altogether and worked on a Granada TV soap opera called “Families”. With 46 film appearances to his credit he has been in some truly outstanding movies. Some of my favorites are; The Aviator, Enemy at the Gates (5 stars), and Sky Captain and the World of Tomorrow. Cold Mountain is well received but I consider it a chick flick. Of course he’s the man you would expect in a chick flick having twice been named to People Magazine’s “50 Most Beautiful People”! Law has four children; three with ex-wife Sadie Frost and one with Samantha Burke. Law has been nominated twice for Oscars and won many awards including a BAFTA. As I write this he has one movie in filming and four in post-production, including Sherlock Holmes: A Game of Shadows. I hope it holds up to the previous film and that there are more. Am enjoying these posts on the many Watsons. Didn’t even know many of these Watsons existed! Hardwicke is my favorite “classic” Watson, but I think Law (and the Ritchie adaptation itself) is a whole other Watson and can’t be compared to other canon-ish or traditional portrayals; the action aspect puts him in another tier. Martin Freeman is my personal favorite all-around Watson. Even though he is in the 21st Century (and it is certainly hard for me to envision Freeman in a mustache and bowl hat, lol) I think he embodies every trait that we get from the canon Watson. However, Law’s portrayal of Watson as an intelligent and loyal, but independent and clever sidekick puts him up there in the best of the 19th Century interpretations as well as one of the best all-around ones. Glad you’re enjoying the blog. I’m looking forward to the next season on BBC also. Although , Freeman might try a moustache but the bowler is definately out!